Basic skills of the English language for special interest students requiring such a course. Non-liberal arts. The Department. Introduction to expository writing with weekly writing assignments emphasizing skills in developing ideas, organizing material, and creating thesis statements. Assignments provide practice in description, definition, comparison and contrast, and argumentation. Additional focus on grammar, syntax, and usage. Students and instructor meet in seminar three hours a week; students are also required to meet regularly with a Writing Center tutor. This course does not fulfill the all-college Foundation requirement in expository writing. The Department. This seminar immerses students in the process of producing finished analytical essays informed by critical reading and careful reasoning. Special attention is given to developing ideas, writing from sources, organizing materials, and revising drafts. Additional emphasis is on grammar, style, and formal conventions of writing. Students respond to one another's work in workshops or peer critique sessions. Weekly informal writing complements assignments of longer finished papers. Each section of EN 105 focuses on a topic that is listed in the master schedule and described in the English Department's prospectus and on its Web page. This course fulfills the all-College requirement in expository writing. The Department. The honors sections of EN 105 offer highly motivated students with strong verbal skills the opportunity to refine their ability to analyze sophisticated ideas, to hone their rhetorical strategies, and to develop cogent arguments. Toward these goals, students write and revise essays drawing upon a variety of challenging readings and critique each other's work with an eye to depth and complexity of thought, logic of supporting evidence, and subtleties of style. The English Department places some students in EN 105H and encourages other students to consult with their advisors, the director of the Honors Forum, or the director of the Expository Writing Program to determine if this level of Writing is appropriate. Each section of EN 105H focuses on a topic that is listed in the master schedule and described in the English Department's prospectus and on its Web page. This course fulfills the all-College requirement in expository writing. The Department. Instruction in classical and contemporary argumentative writing. Practice in taking a stand and building a case. Analysis of arguments from the perspectives of logic, rhetorical appeals, and audience. Prerequisite: completion of the college Expository Writing requirement. Intensive practice in the writing of polished essays that begin with the writer's experiences and move on to explore the relationship of the self to the larger world. Emphasis will be placed on finding a personal voice, exploring a variety of contemporary issues, developing one's ideas, and effectively revising one's work. Readings include personal essays by both classic and contemporary writers such as Montaigne, Lamb, Didion, and Gates. Prerequisite: completion of the college Expository Writing requirement. Intensive practice in writing arts reviews on topics such as art exhibits, music performances, dance, films, public lectures, and current literature. 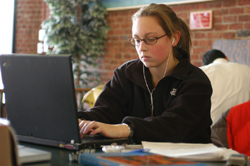 Writing assignments focus on forms such as the short review, the essay review, and the profile. Reading of selected reviews by accomplished writers and critics, and analysis of writing from the popular press, scholarly journals, and arts magazines. 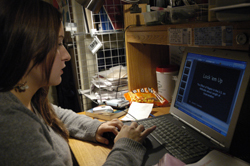 Requirements for the course include attendance at arts events on the Skidmore campus and throughout the Capital District. Prerequisite: completion of the college Expository Writing Requirement. Intensive practice in a particular form of expository writing or intensive exploration of a subject with special attention to style and the development of a writer's voice. Topics studied may include, for example, biography, technical writing, or writing and the Internet. Prerequisite: completion of the college Expository Writing Requirement. Examination of rhetoric, grammar, and composition theory essential to writing, collaborative learning, and peer tutoring. Students practice analytical writing and critique expository essays. Weekly writing assignments and a term project explore composition theory and tutoring practices and analyze EN 103 assignments. Participation in a weekly supervised peer tutoring practicum with EN 103 students. Prerequisite: EN 201 and 202 (in sequence); and EN 211, or 213, or 215; and upperclass standing; and permission of instructor. - P. Boshoff, C. Golden, M. Marx, L. Simon.